What is double-compartment (aka double-sided) housing and why is it essential for housing cats and dogs in animal shelters, clinics, and hospitals? Housing plays a key role in animal health. For pet animals, the housing we use in our clinics, hospitals and animal shelters can promote their well-being and reduce stress if it meets the animal’s basic housing needs. Double-compartment housing promotes animal well-being and is the easiest for staff to maintain. Double compartment housing is simply housing that has two separate housing areas connected by a door, pass-through or portal that provides adequate space for the animal and allows 24/7 access to both sides of the housing. Generally during cleaning the animal remains in the housing unit on one side while the other side is cleaned. Dogs' and cats' natural behavior is to eliminate away from where they sleep and eat. The two compartments meet this need by providing animals with an area for their bed, food and water and a separate area for elimination. Double compartment housing also tends to more adequately provide animals with room to move around- "adequate space". It’s difficult to say exactly where the cut-off is for housing space size, but too little is often the norm when animals are housed in single compartment housing. For cats, we recommend about 8-9ft2 or greater of cage floor space. This turns out to be at minimum a 4’ long by 24-28” deep divided cage housing unit. Most older cage housing is retrofittable using a portal between two 2’ cages. A 5’ long unit (two 30” long by 28” deep units with a pass-through portal works very well and is what is recommended if building new). For dog housing the size needed is variable but some common kennel sizes are 4-5’ wide by 10-12’ long for med-large dogs and 6’ wide by 10-12’ long for giant breeds, each being divided in the middle by a transfer door (guillotine door). No matter the size, cages and kennels are housing that imposes restrictions on a pets’ movement and natural behaviors. Our research has shown significant behavioral differences in cats housed in single vs larger double compartment cages as early as the first 24 hours of stay. The more restrictive the housing, the shorter the time that that space will meet an animal's needs. Adequate space provided by double compartment housing can help support most animals' physical and mental well-being. Keeping an animal’s length of stay as short as possible is key to keeping them healthy and happy in restrictive housing. Animals that need to stay longer need longer-term housing and care needs met to maintain health and well-being. Always be aware that there are some individual animals for whom cage and kennel housing simply does not meet their needs. Providing adequate care for these animals means alternative housing must be found as soon as possible. Prevention of disease and disease transmission is a high priority when caring for a population of animals - yet few understand the critical role housing plays. Disease has more opportunity to occur in animals that are stressed. Restrictive housing inherently causes stress in animals and when this housing is such that it doesn’t meet the animals' needs it can cause further stress. Some animals carry diseases that can be activated by stress- ex: many cats carry a virus (herpes virus) that awaits a stressful event or situation and subsequently results in illness: upper respiratory infection (URI) or a kitty cold. For a cat in a home, a cold is not often a big deal - most cats will recover in a week or two, but in a shelter - sick cats can get very sick and be at risk for euthanasia. Disease transmission risks occur when an infective organism gets passed from one animal to another. Vaccination at intake can help reduce risks by preventing and controlling disease. Limiting contact between animals also reduces disease risks. Limiting contact between animals can be achieved by housing animals individually and this is a common practice in most clinics, hospitals and shelters. The problem arises when individually housed animals are handled to provide routine daily care – which is what generally needs to happen when animals are housed in single compartment housing units. Single compartment kennels cannot be cleaned without moving the dog out of its kennel and most single cages that house cats are too small to clean (ideally spot clean) with the cat inside. When animals are handled two things happen. First it can be a stressful time for the animal, especially when they haven’t established a relationship with the care provider and second, the likelihood of passing an infectious organism from one animal to the next becomes part of the care process. Handling animals one after another during the daily routine of cleaning and feeding heightens disease transmission risks. Wearing gloves and changing between each animal may help to reduce contaminants on one’s hands but it can be a hassle – so it often isn’t done properly - and it doesn’t address the contaminated clothing or shoes. With double compartment housing much of the animal handling surrounding daily care (feeding and cleaning) can be reduced, thus a significant decrease in animal stress and disease risk can occur without anyone really having to think about it – it just works as it's part of the design. Many animals entering shelters, clinics or hospitals are timid until they get to know their new environment and the people that are caring for them. Some may show signs of fear or aggression. Animals that must be handled because their housing is single compartment can experience tremendous stress. Some animals express fear and stress simply due to a person approaching their kennel when no place for retreat is provided. Staff safety and humane animal care are both better provided when all animal housing is double compartment. With most double compartment housing the animal has a place to retreat within its housing environment and limited to no handling needs to occur. 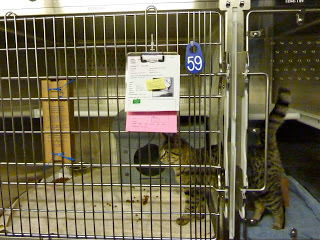 The animal can be located safely on one side of the housing unit (via use of a pass-through with the door closed) while the staff member safely tends to the daily care needs on the other side. Efficiency of care. Staff only have so many hours a day to provide for all the daily care needs of the population of animals. Daily cleaning and feeding is something that must be done every single day. It is often the first task of the day and if it takes a long time and there is not much time left over - well, other things just won't get done.... perhaps it’s phone calls that could help an animal in the community, or helping an interested client or adopter, maybe it’s not having time to walk the dogs or provide cats with some out of cage time or perhaps it means not noticing that an animal is not feeling well or any number of a long list of tasks staff need time to do - but which gets put off to another day. Having the daily routine of cleaning and feeding take up less of the work day can free up staff time for other important tasks. Providing animals with double compartment housing not only meets their needs and helps reduce stress but also provides staff with the safest, most efficient and humane way to care for pet animals when they are housed short-term in animal shelters, boarding facilities, veterinary hospitals and veterinary clinics, etc, anywhere kennel or cage housing is used. Double compartment housing for pets is win/win-meeting the needs of the pets and those who care for them.